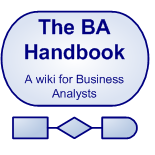 I asked my friend Nathan to donate a short article to the Business Analyst Handbook. He generously donated the below. Nathan is midway through a successful career that has included consulting, a tech start-up, and now is involved in greening the world through encouraging investments in sustainable and green businesses. In amongst it all he has worked on several tech and no-tech projects as an analyst. While it is easy for BA's to rely on process, IT or systems skills to get a gig, to advance your career it is important to add to your skills tool bag. Skills that make most sense are often included in the umbrella term - 'project management skills', but what does this mean? Key facets of project management skills might include, budgeting and financial management knowledge, communication and media management, people management and that often overlooked skill - the ability to write concise and clear management reports - for all important project sign-off's. Starting with reporting - if you have never prepared a report for a board or a senior management team, find someone who has and see how one is written. There is an art to clarifying your messages and getting people to agree with you. And don't assume that high level summaries get the job done. It is important to carefully analyse the outcomes you are after and tell your senior reports exactly what you want them to do. On financial skills there are two observations I'd make. Treat the project budget like it is your money. The boss will take you seriously on managing a budget when he or she doesn't have to worry that you'll blow theirs. On communication and media, don't underestimate the specific skills involved here. Clearly identifying stakeholders, the issues you'll need to manage with them and the way your program will be perceived within your organisation and externally are essential project management skills. If your program has some community impact and may hit the papers, then the importance of these skills is greater. Get some help if you need it.